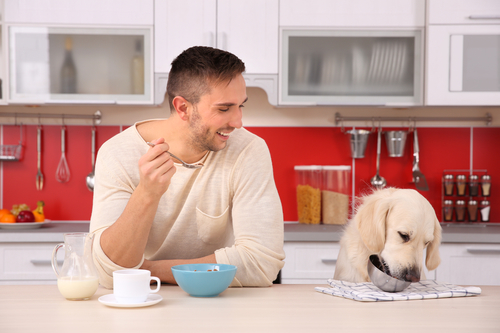 You love your four-legged friends, but lately, you’ve noticed that your kitchen tiles are looking a little worse for wear. Fortunately, you can still enjoy life with your dog or cat and a clean kitchen. The experts at Devine Creations Design Center, a tile store and design firm in Middletown, NJ, share these essential facts that every animal-loving homeowner should know. If your pet is clean, they won’t be able to track excess mud and dirt into your home after frolicking around outside. Keep an old towel or disposable wipes by the door to clean their paws (and their fur) before they enter the house after walks or outdoor adventures. If you keep your pet’s food and water bowls in the kitchen, consider investing in a raised feeding station, which will make cleanup easier. You’ll be able to sweep away the crumbs that build up under their food bowls and mop up standing water. If your pet has a habit of relieving themselves on the kitchen floor, speak with a veterinarian first to ensure it’s not a symptom of an underlying problem. If their health is in the clear, consider installing a pet door if your kitchen opens out into your yard, or speak with a pet trainer to help your furry friend learn to relieve themselves outside. In order to stay on top of messes, plan on sweeping up wayward debris and pet hair as often as possible—at least every other day. Built-up debris, water, crumbs, and urine can damage your tile and grout over time. When in doubt, visit a local tile store to speak with a flooring professional—particularly if you’re concerned that the material on your kitchen floor won’t hold up to your pet’s wear and tear. Porcelain or ceramic tiles are ideal for homes with pets because they don’t scratch easily, and Fido’s occasional accidents won’t damage the tiles. If you aren’t sure where to start, reach out to the experts at Devine Creations Design Center for personalized maintenance and cleaning tips. Residents and animal lovers in the Middletown, NJ, area, trust this tile store because they put customers first, whether they need kitchen remodeling or design consulting for a full home remodel. To learn more about their services, call (732) 856-9661, or visit them online to view their tile store inventory.